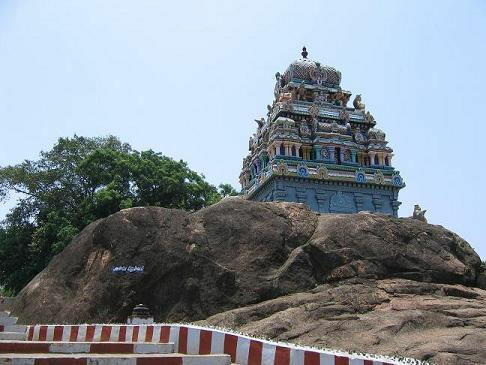 On April 14th, Tamil New Years Day, uncle came home and exclaimed - your manni wants to go to a Lakshmi narasimha temple today.. She is talking of a temple in Sholingur, can you find out about it or other temples? After a quick on my ipod touch, i read out some facts about that temple, distance etc... Given the heat, uncle said -no way, thats too far off and climbing a hillock in this blazing sun is just out of the question.. Any other options? [Ding Dong ]Thats when it hit me.. Singaperumal koil, near Chengelpet.. I had been there with Lakshmi about 7months back and it was a Narasimha temple, and i was very sure we saw a Lakshmi narasimha idol there.. Narrated in detail to uncle and then to aunt about the temple, how far it was, and how it was built inside a mountain, and the giri valam or pradakshanam was done around the temple, on the hillock... Managed to find the number and found out that the temple is open till 12noon and then 4pm onwards..
We reached the temple at 4pm, but the priest came to open the doors only around 4.30pm. Aunt had a bit of doubt if there was an idol of Lakshmi narasimha, but that was put to rest as we proceeded towards the main sanctum... I quite like that temple, there is soemthing peaceful and powerful about the place!!! A sense of Deja vu hit me as we passed along familiar places and paths... Kept remember bits and pieces of conversation Lakshmi and i had had earlier... the car, AC not working, all of it came flooding like as if it was a trip taken few days ago!! 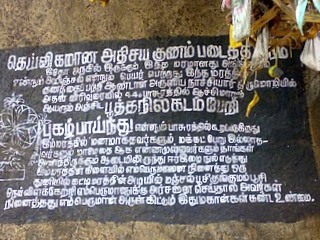 I never knew of such a temple near Chengalpet. Next time, I am traveling to Chennai and nearabouts by road, I should visit this place. My dad would be elated to visit this temple. Thanks for sharing this information with us. Its a really beautiful temple.. I had been there when my father in law was working for a while at Melmaruvatthur... we visited a lot of temples in and around the place, but this is one which stands out well in my memory..... have to take Samhith again... he will enjoy it..
Short and crisp post. It is those small places that have something special associated with them. Those deja vus. :) Sometimes good, sometimes not. Sankara - oh, its quite popular alrght. do visit!!! Anu- :) i like the temple, esp the giri valam on the small hillock around the main shrine!! RamMmm - yep, that is true... Thanks for the lovely words!! This festive season make your holidays mesmerizing trip to himachal and create your album with most happening moments of your life.